Sydney, like all cities, is in transition. In the last two decades, Sydney’s most significant transition was from an employmentfocused Central Business District, or CBD, to a vibrant and truly mixed-use city where people live, work, learn, shop, recreate and just stay. Sydney benefits from its unique situation on a spectacular harbour. Its foreshore (waterfront) and the iconic architecture of the Sydney Opera House and Sydney Harbour Bridge have dominated the identity of the place. 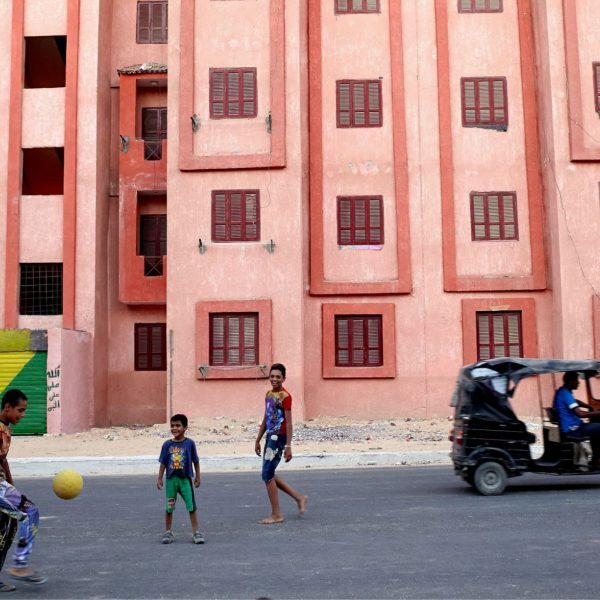 Since hosting the 2000 Olympic Games, the planning of the city shifted its focus beyond the foreshore to extend into the streets, laneways or alleys/back streets, civic and open spaces that compose the public realm. The local government authority responsible for planning the city, the City of Sydney, has implemented a series of initiatives that move towards achieving a more human-scaled city. Several initiatives demonstrate the intersection between design and placemaking in Sydney and these initiatives represent a new tool to help discover its identity and personality. 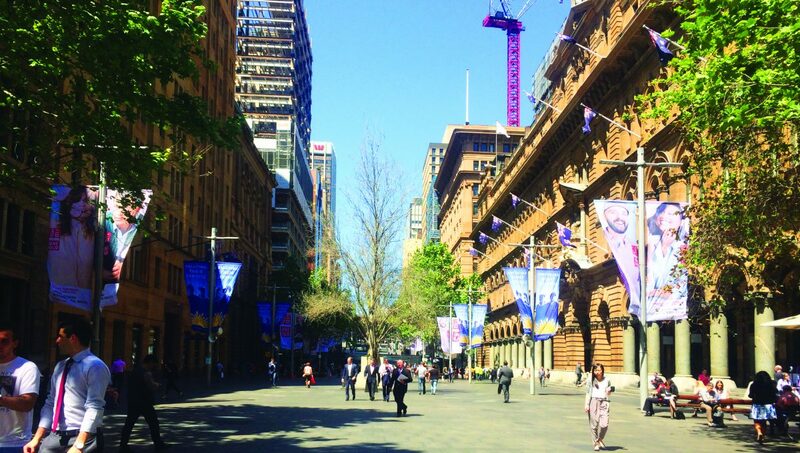 Historically, the first evolution of Sydney towards a people-focused city included the redesign and pedestrianisation of two major streets: Martin Place, a 20 metre wide pedestrian mall overlooked by major financial institutions, and Pitt Street Mall, Sydney’s premier retail street that collects the fifth highest retail rents in the world. Martin Place thrived with pedestrians when workers walked to work from a nearby train station or bus stop, from their office to get lunch, then back at the end of the day. However, it was vacant and sparse on weekday evenings and throughout the weekend. Programming was non-existent; there was no incentive to stay in these streets beyond regular work hours. In 1996, 88,000 residents lived in Sydney’s CBD. By 2011, that number had doubled and the trend continues. To complement this influx of residents, the City of Sydney introduced several place-based policies that deliver an additional layer of complexity to the public realm and experience of Sydney at eye level. At Martin Place, an events overlay was applied with concerts and festivals in the evenings and weekends, creating an extended vibrancy. At Pitt Street Mall, suspended illuminated artwork now draws pedestrians into and through the mall at night. In addition to these large-scale interventions, a series of smaller scale interventions establishes a new framework for placemaking and the identity of Sydney. The City of Sydney set out to revitalise the CBD’s hidden network of existing, underutilised narrow laneways (alleys). A public art policy and a “Fine Grain Matching Grant” specifically for the laneways have transformed them into shopping and dining destinations. A complementary public art policy installed art to transform the once dark and uninviting thoroughfares into welcoming public spaces. Three temporary installations were awardwinning and proved so popular that they became permanent installations. The Fine Grain Matching Grant provides matched cash funding of up to $30,000 to assist small businesses looking to relocate in laneways and other underused areas. 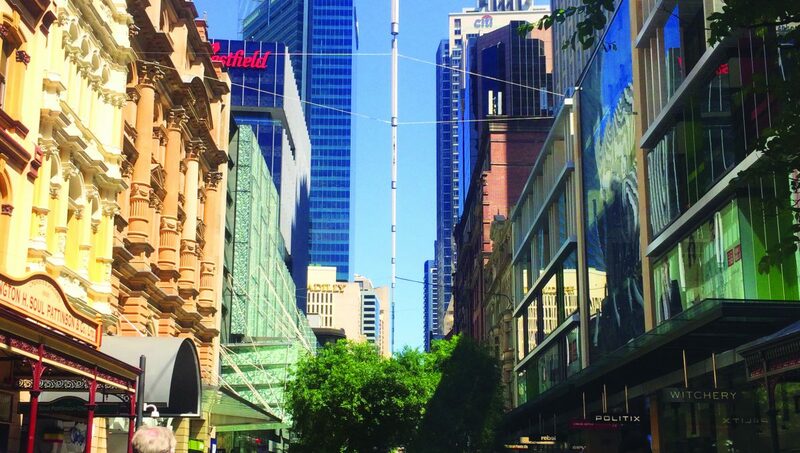 The City of Sydney defines a fine grain business as a small scale, diverse and innovative business engaged in specialist retail, hospitality or entertainment and encouraging activation of underutilised spaces such as city laneways and basement spaces. The revitalisation of the laneways has been staged. Incremental improvements have been made, tested, reviewed, analysed, then further spending has been allocated to more laneway revitalisation projects based on the success of the earlier laneway revitalisation projects. 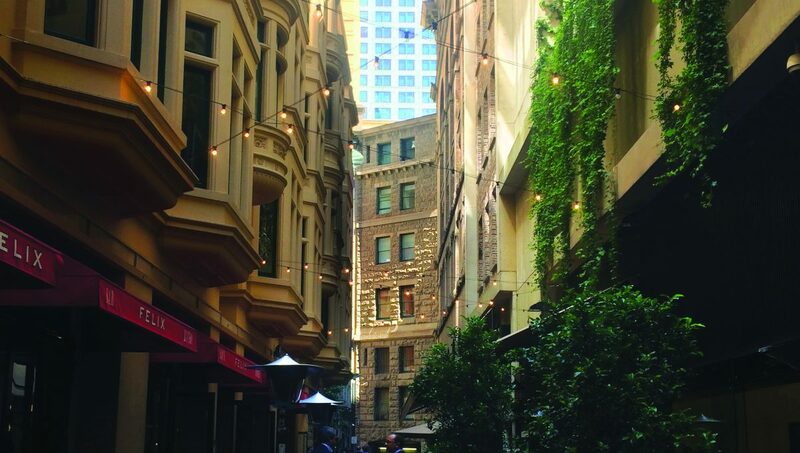 The City of Sydney has identified a vast number of laneways within the CBD and only a handful have been revitalised to date. These new fine grain policies have reoriented the public realm from the harbour’s highly visible open space to the discrete and gritty laneways. The rejuvenation program brought together government departments, young entrepreneurs and large establishments and provided $10 million in infrastructure upgrades to support local business. The effect of these initiatives is clearly evident in the public realm – the visual experience of the city at eye level is more engaging and stimulating, the physical experience of the city is more diverse and pedestrian scaled. Strolling through the city, one can turn off the main street, stumble upon an intriguing laneway, discover an exquisite art installation or a flourishing small bar tucked into a basement. The laneways create an element of surprise beyond the main streets of the CBD. While the City of Sydney’s urban design and planning policies have enabled this transformation, its success depends on human patronization—people have to use the place. 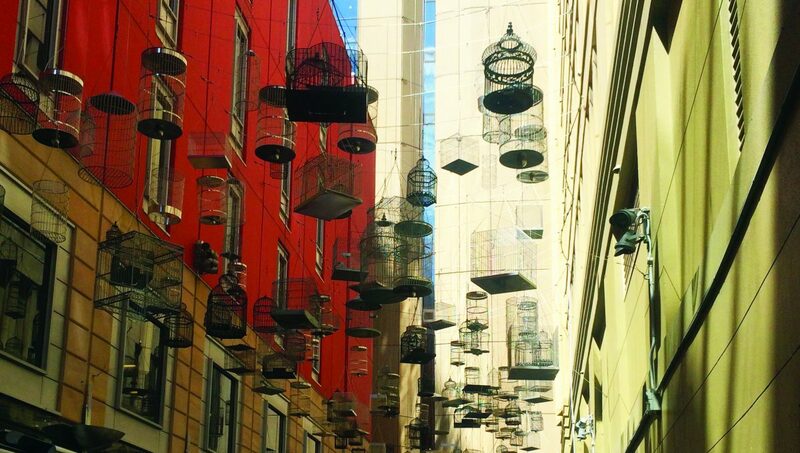 Residents, workers and visitors have embraced the new experience on offer and claimed ownership of Sydney’s laneways. They consume not just the retail, hospitality and entertainment on offer, but also the place. The packed café tables and bar stools spill out into the laneways; passers by stop to say hello to a friend; tourists people-watch and photograph the public art. Sydney’s laneways have become so much more than just service lanes or shortcuts between the main streets. The City of Sydney recognises that people activate urban spaces and reinforce the identity of place. To meet the demand for placemaking through urban activation and space consumption, the City of Sydney implemented an extraordinary events and programming overlay with impressive events every month. The programming builds upon the urban design and planning framework of the CBD, allowing residents, workers and visitors to participate and reinforce a real and authentic identity for the place. On a macro scale, large events take place in significant public spaces, like the New Years Eve fireworks, attracting more than a million viewers and picnickers to the harbour foreshore. And on a micro scale, the laneways host temporary public art installations for the Sydney Festival and Art & About, they are transformed through night-time illuminations for Vivid Festival and their cafes, restaurants and bars offer gourmet treats for Good Food Month. The experience of Sydney’s streets, laneways, civic and open spaces goes beyond urban design and planning. Sydney is no longer a onedimensional experience of the Opera House and Harbour Bridge. It has evolved into an intricate and complex assembly of both large and small scale, place-based initiatives that incorporate a mix of uses, layers of public art, a program of daily, weekly, monthly and annual events. People now engage with their city, participate in events and activate the public realm at all scales. This is placemaking by the people.